Udemy.com is a well known learning platform that is hosted on cloud. If you wish to add new professional skills into your resume in order to get best job as per your passion then Udemy is the best place for you. Same as other traditional course works that are developed at college level such as academic MOOC program, Udemy also give opportunity to various experts to host courses online with or without tuition fee so that public can take maximum benefits out of it. Professionals can promote their courses over this platform and earn money by providing tuitions to those who need to sharpen their skills. Here experts are able to create specific plans and well structured content for delivery. Various active learning methods are employed in Udemy courses like projects, exercises and quiz. Professionals can also teach via video lectures of 2-20 minute duration. All courses are generated with quality technologies to offer clear audio and video. Full HD content is available. Almost 60% of course content can be accessed in form of video lectures. Presently Udemy is running about 42000 courses and more than 14 million students are enrolled in these active learning classes from different 190 countries. The best thing to know about these courses is that content can be accessed on mobile as well as desktop computers, that is why it is rated as one of the best online learning platform. Some of the most popular courses of Udemy are technology, music, language, health and fitness, arts, academics, business and entrepreneurship. The Udemy for business courses are succeeding towards their target with about 1300 training courses and the course topics are related to programming, management, design, office productivity, digital marketing tactics and many more. You will be glad to know that the course fee is very limited at Udemy platform, most of the courses are available with the payment of $5 whereas few can vary up to $20 or $200. Learners can also access many free courses at Udemy.com. Presently there are more than 14000 instructors working with Udemy and they provided courses in 48 different languages so that learners can avail information without any communication barrier. With the increasing popularity of these online courses, now average instructor is able to generate approximate earning of $8K whereas as per a recent report of year 2015, the top 10 instructors of Udemy were able to generate total revenue of $17 million. The instructors at Udemy are able to enjoy their life to the fullest because they are allowed to teach what they want to teach. They can freely work in the field they want and can use different innovative techniques to train others. It makes the processing of training and learning so impressive and useful where people can everyday avail new information in much creative way. The instructors are able to earn about 97% of the collected tuition fee because Udemy use to keep only 3% as fee processing cost. So if you are well experienced and confident enough about what you teach then definitely you can attract more learners and your revenue will be automatically boosted. 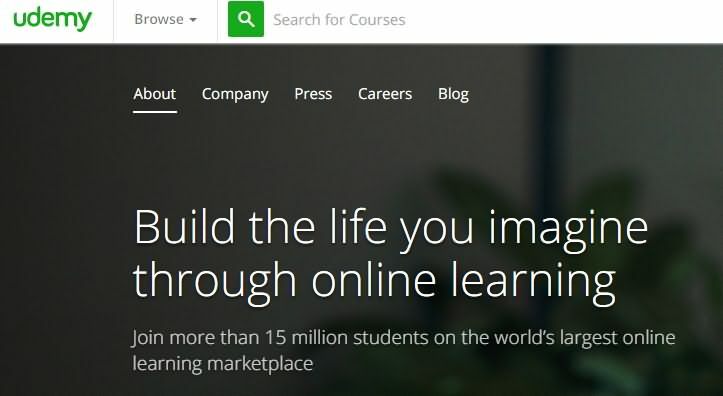 In case if the students are attracted just because of the marketing efforts of the site and the presented coursework then Udemy use to keep 50% of total earnings. When it is Udemy.com academies promotional affiliate which attracts students to the course and site then also instructor will be able to earn about 25% of total tuition fee. How to Choose Udemy Courses? First of all go to the language selection option; choose your preferred language so that you can avail content in understandable form. Now you can make selections for additional features like Quizzes, coding exercises etc. On the basis of popularity. I am a freelance physiotherapist who works with individual athletes. My purpose was to find options to increase traffic into my personal blog on Facebook page. Somehow I found your comment like month ago when I was googling for the best free course suppliers. Bitdegree "Learn How to Advertise on Facebook" tough me the image of driving traffic to my personal blog, in the past 2 weeks I increased it by 55%. thanks mate! Hey, Liza, what do you think about Udemy content compared to other tech education webs? I have always been using Coursera, but somehow my friend and I came to Udemy after one workshop, like two years ago and it growed on me. Finished like 20 courses in game development and graphics. So same friend recently showed me BitDegree, and I'm amazed they have top-notch quality lessons packages and even gamified ones, almost same as Udemy it's just for free and everything based on blockchain technology.